Climbing the steep mountain North of our Arba Minch lodge to the chilly and rainy upland country, there are fine views back down towards the lakeside town and one passes signs of the 20,000 tourists that visit Arba each year - stalls selling colourful traditional weavings and hats- as well as slow trudging women bent double under heavy loads. 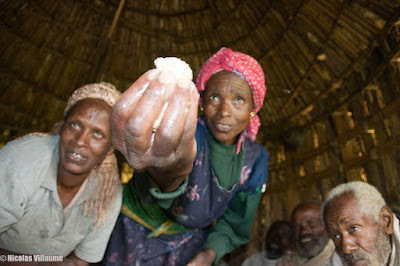 Arriving in Che'ncha, the team met the elder Mazge Gazato in the Zozo village. 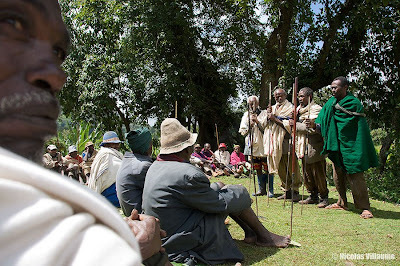 Mazge led the team via deteriorating roads to Gadhosa, a traditional public forum on sacred ground locally called “dubbusha” where 25 male community elders were dealing with their community issues. 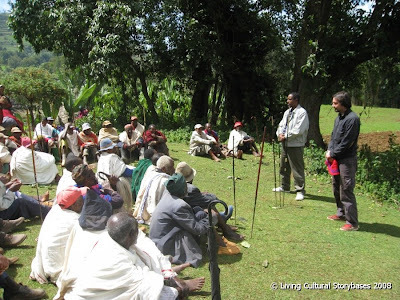 The visiting team was permitted to explain its mission to the elders. We did as allowed talking of our work in Mali and Peru. We explained the LCS techniques for bridging the generational gap, thanked them for the chance to meet them and appealed for their reflections. The elders, the most senior Kosha Kodo speaking first, responded by expressing their support for the LCS mission and said that they would be very happy to work with LCS. They were grateful to the visiting team for coming to see them, and thanked the program organizers, Dr. Tadesse Wolde (TCF) especially, and Mazge and Darout for their facilitation. He explained the dubbusha ground: "This is the place where we bless and curse and resolve conflicts. It's a sacred place." Nicolas drew comparisons with the Peruvian culture with which he works for LCS, where people worship the sun and Mother Earth and mountains are sacred. Parallels were noted: "The mountain is very important for our animals' health, we respect the sun also". Standing in turn to speak to the seated audience, planting their ceremonial spear before them in the ground, the elders said: "We have many stories, we can produce many of them for you, we hope we work with you. 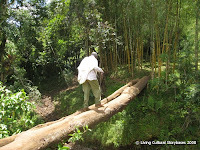 We can tell you about the bamboo we use for many things, or about this big old 'borto' tree. The trees help heep the ecology in balance, bring us rain and preserve the moisture. We have stories but also traditional ways of expressing bravery." The second speaker said "The young people are not willing to participate or even watch us performing animal sacrifices. The young say 'Why do you kill an ox and waste your money on a sacrifice? You should give up these old ways and join the modern world'. They say this, but we feel it's because we had these ways from our fathers and grandfathers and should continue. Even during the prohibition time (the Derg regime), we secretly continued the sacrifices. Look at this stick, it's a symbol of our titles. After Tadesse's many efforts we are now enjoying our traditional ways again. We have our mountains which are sacred and our places for practicising our belief. Here we pray for health, property and peace." The last speaker, Sahanka Salamo said: "If you have come to help this traditional way of life again, we would be very happy to help you in any way we can and work together." Ditcha Dilbe added: "We would like to go deep in our tradition, but our children are a source of fear for us". Closing, Paul and Nicolas formally thanked the congregation for their greetings, the mutual respect and for this dialogue. In closing, the whole assembly was blessed by the most senior speaker, wishing peace for all and including two marginalized men who had had to sit on the edge of the group. 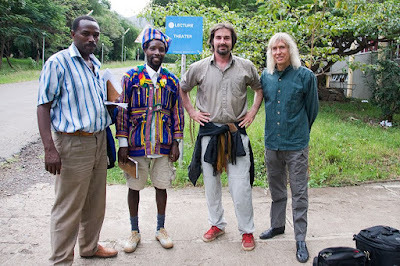 Then Mazge led the team to the Boye Cultural and Environmental Protection Association’s nursery site. The team was briefed by the gardeners about their 3 year old program for cultivating seedlings of indigenous trees which had been on the verge of extinction, which has been supported by TCF matching funds from the indigenous association, IDRE. The Boye association is nursing indigenous tree seedlings like those of Soadho, local Tseeda, Anka, Borto, Mudha and the leguminous plant Motchi Ba-ela, which is known for its power to restore fertility to agricultural lands (by nitrogen fixation). 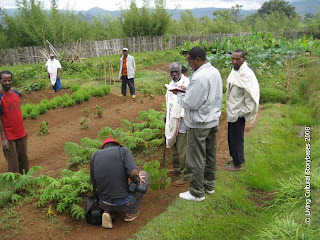 The seedlings are distributed to community members in five surrounding villages. The efforts of this association are 'bearing fruit' in that the threatened indigenous trees are now growing in the plots and land of many families, according to the gardeners' report. Thereafter, the visiting team were invited by their hosts to a traditional meal for the first time, in a traditional hut at the nursery. We enjoyed the shaassha (roasted barley), the gurddo (roughly ground barley boiled with milk and butter), and the parsso (local ale made of brown wheat with boiled water). The team had the feeling of being ‘at home’ with the community members and left for Terenke’s house. 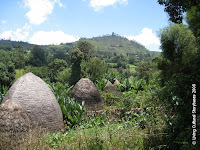 Much amusement was caused by the local tradition where the women themselves force very large balls of mealie which are difficult to swallow into the mouths of the visitors. The landscapes and the peoples of this region at an altitude of about are very reminiscent of the Northern hilltribe region of Thailand. 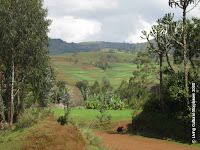 This lush mountainous country is cut by deep riverbeds that we had to cross on foot for our next visit to an old woman. Terenke, the 'visionary' soothsayer living in the Basso Valley, served us with hospitality that also included the shaassha, the parsso, traditional bread and milk. We could only help with some of the shaassha but not with any of the other food as we were full from the 'forcible feeding' at the nursery! 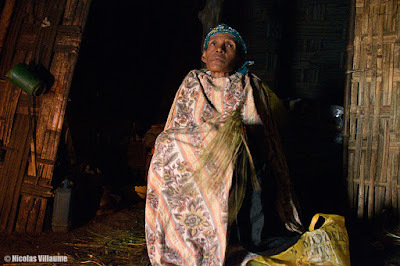 We listened to Terenke’s stories about her clairvoyance and prophesies. Her life has not been easy, and the responsibility of being able to see something of the future seemed to weigh in her. On certain days of the week she accepts visitors who request an audience for her advice and bring gifts in return. After a while, we had to bid her farewell for the time being. reassuring her that we would return soon to see her again, and hurried down the mountains to our scheduled Arba Munch University LCS presentation . 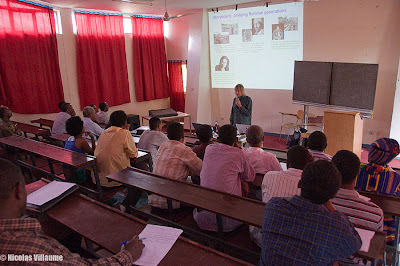 In the University Lecture Theatre, the meeting began at 3:30 P.M with 22 attendants. LCS financial provision was made for the two Parka representives whom we had met earlier to make the journey to Arba Minch to participate. One hour after the start of the presentation, the power unfortunately went off, so Paul and Nico had to continue without amplification or projection. The following questions were raised by the attendees after the presentation. 1. Could there be any possibility to use video with, or produce movies of the traditional cultures? 2. How would it be possible for you to introduce the LCS technology in Ethiopia in the face of inhibiting government policies? 3. 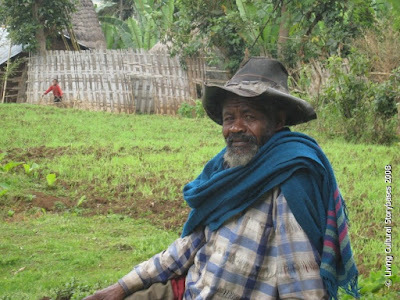 South Ethiopia has more than 56 tribes, so how would it be feasible to accomplish LCS aims in all these cultures? LCS is dealing primarily with stories in cultures with a long heritage of oral storytelling, where the craft of spoken storytelling is widespread. Of course, it is possible to produce videos or movies to tell stories, but one must consider the social inclusivity of film or video production. The latter requires an understanding of the craft of cinematography, so only a few in a community may take on board the skills of its creation and editing. LCS focuses first on starting simply with spoken stories plus still images, their exchange and on triggering cultural dialogue around stories, at the same time developing a capacity with digital technologies. Perhaps later including community empowerment in participatory video or film production, as is done by other NGO's such as the Digital Storytelling Centre and Insight, see http://www.insightshare.org/ might be a good complementation. LCS is assessing ways to implement its goal in Ethiopia taking into account many factors. 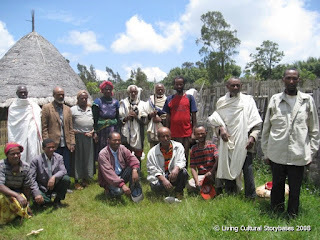 When considering traditions, we talk about 'nations' (cultures) and these nations have been encouraged to develop and promote their cultures and histories under the current Ethiopian constitution. Thus, there seems a good policy ground to take up this opportunity and get government cooperation with LCS on its mission. 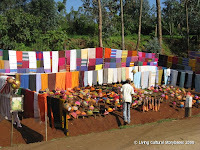 LCS is thinking of starting a pilot project with one ethnic group first in Ethiopia. Then it might expand, via well-established partners such as Parka for fast duplication and this way might be able to satisfy more cultural needs and interests.